When I first heard that the well-known 1990 film Ghost had been turned into a musical that played in London’s West End and then on Broadway, I have to admit I was skeptical. I’m a little weary of the recent trend of musicalizing popular films, and I wasn’t sure if Ghost needed to be a musical. After seeing the current Troika national tour–based on the Broadway production–at the Peabody Opera House, I’m still not sure this adaptation was entirely necessary, although I did find it entertaining, full of flashy and stunning visuals and some good performances. This musical, like the movie it’s based on, tells the story of Sam Wheat (Steven Grant Douglas), a successful young banker with a life that seems too good to be true. He has a job he loves, a great loft in Brooklyn, and a loving girlfriend in artist Molly (played at this performance by understudy Andrea Rouch). As Sam and Molly look forward to a happy life together, Sam is suddenly and brutally murdered in what appears to be a mugging gone wrong. Instead of moving on into the afterlife, however, Sam finds himself stranded on Earth as a ghost. After meeting a few other ghosts who give him a few pointers (in the song “You Gotta Let Go”), Sam follows Molly and soon finds out more about his murder and the involvement of his co-worker and former best friend Carl (Robby Haltiwanger). Upon a chance meeting with self-proclaimed psychic and con artist Oda Mae Brown (Carla R. Stewart), Sam finds that he can communicate with Oda Mae and sets out to get a message to Molly before anything bad can happen to her. The plot follows the film fairly closely, including the famous song “Unchained Melody” that was so prominently featured in the movie. The rest of the songs are original, though, and most aren’t particularly memorable. 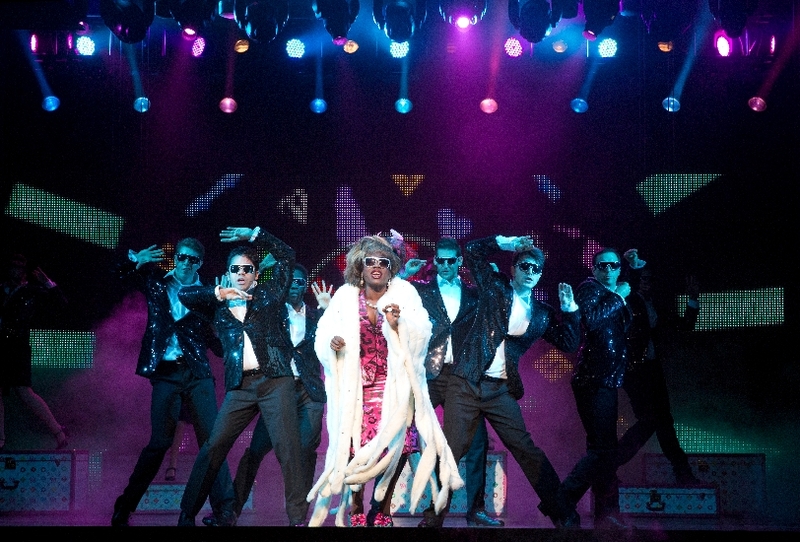 The songs that do make a positive impression include Oda Mae’s introduction song, the gospel and disco influenced “Are You a Believer?”, Molly’s poignant solo “With You”, the Act Two opener “Rain/Hold On” and Oda Mae’s Act Two showstopper “I’m Outta Here”. Aside from these songs, though, I find it difficult to remember much of the score, although it’s mostly well-sung by the youthful cast (many of whom are recent college graduates). It’s a smoothly-told story but the young cast (especially the ensemble) doesn’t always bring the energy, and live theatre is about energy ultimately. I do think the show got better as it went along, though, and the finale was particularly moving and well-done. Still, this is an engaging show for the most part, with some strong performances by the lead performers, particularly Stewart as the feisty Oda Mae and understudy Rouch as the at first hopeful and then grieving Molly. Douglas looks and sounds good as Sam, but is somewhat lacking in stage presence in this pivotal role, especially at the beginning of the show. He does gain strength as he goes along, and he does well in his scenes with Rouch and Stewart. Haltiwanger is fine as Carl, but like a lot of this cast, I wish he had more energy and presence. Brandon Curry makes a memorable impression as a surly Subway Ghost who becomes Sam’s reluctant mentor. The biggest strength of this production is in its physical look and special effects, re-created from the Broadway production. It’s a very flashy show set-wise, making use of many projections including city scenes and images of people, as well as moving images to represent the subway cars and an elevator. The special effects, such as those used to make objects fly around the stage, and people “rise up” out of their bodies when they become ghosts or are carried into the afterlife (surrounded by an ethereal silvery white light for good guys, and angry red lights for bad guys). Kudos to the whole team that designed and/or re-created the lighting (Hugh Vanstone, Joel Shier), video projections (Jon Driscoll) and Illusions (Paul Kieve). It’s a stunning technical production with a sleek, updated look set in the present day rather than in the movie’s era of the early 1990’s. The effects and visuals help keep the story moving, and some of the special effects even drew applause from the audience. 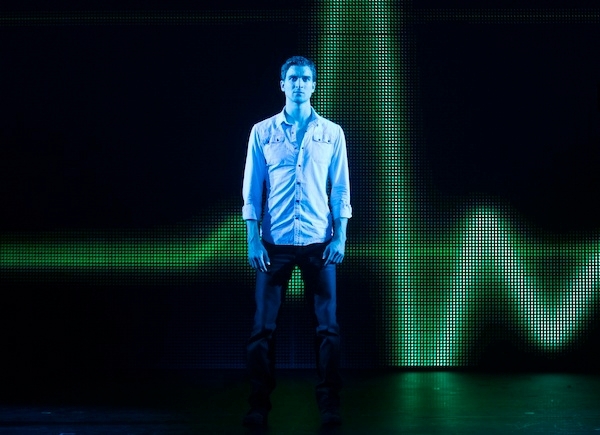 Ghost is an ambitious production that manages to entertain despite its drawbacks. I’m glad I was able to see this show, although I do think that it will be frequently compared to the film, and it doesn’t quite live up to that comparison. For what it is, though, it works well enough, and I was able to follow the story of Sam, Molly, Oda Mae and the rest of the cast with interest and some emotion, especially at the end. I do think that with a little more energy, this show could be even better. It was worth seeing, however, and I think anyone who enjoys a good simple love story with a lot of flashy special effects should enjoy it.